requirements of damage tolerance driven maintenance philosophies. However, despite advances in traditional NDT methods and the development of new NDT methods, the great majority of all inspections being performed are still visual. This is in many ways an economic issue: visual inspections require simple equipment, such as a flashlight, mirror, magnifying glass, or borescope, and are much faster than manual eddy current or ultrasonic methods. Fully automated robotic systems require a large capital investment and are rarely used outside of military establishments. The reliability of visual inspections has been called into question by a number of recent studies, notably by the U.S. Federal Aviation Agency (FAA). Human factors studies applied to NDT in aircraft maintenance facilities (for example, reference 2) have shown that there is a large variety of factors which can influence inspector performance. Many of these factors apply to other NDT methods as well, but with increasing degrees of automation, the effect of these factors can be reduced and the reliability of the inspections is expected to improve. For example, a recent NDT reliability study performed at the Institute for Aerospace Research (IAR), National Research Council (NRC) showed that a completely automated eddy current system was able to perform almost as well as inspectors working in a laboratory setting. The benefit of the automated system is that it is immune to human factors such as inspector fatigue or motivation, or environmental factors such as lighting or temperature. New enhanced visual NDT techniques such as D SightTM and Edge of Light (EOLTM) have been demonstrated to perform well in a variety of aerospace applications, and could provide inexpensive improvement on visual inspections in many cases. However, the lack of a training infrastructure and experienced inspectors has limited their acceptance. IAR has developed hardware and software improvements to these techniques in order to improve the usability and to enable automation, both of which should contribute to increased reliability. Visual and enhanced visual NDT is performed to find surface topographical information, whether it be dents, cracks, corrosion pillowing, or other anomalies. When compared to traditional NDT methods such as eddy current and ultrasonics, visual inspections provide great advantage in speed of inspection and ease of interpretation. This is a significant economic advantage, as the downtime of the system being inspected is usually the greatest cost of performing NDT. Enhanced visual NDT methods such as Diffracto Ltd.'s D Sight or the EOL technique patented by IAR attempt to provide similarly fast inspection while providing increased reliability over unassisted visual inspections. The following sections provide a brief explanation of the D Sight and EOL techniques. In 1988, Komorowski of IAR at NRC suggested the development of optical impact detection systems based on double pass retroreflection, also know as D Sight. The Canadian Department of National Defence, US Air Force, FAA, and Transport Canada joined Diffracto Ltd. and NRC in sponsoring development of commercial D Sight Aircraft Inspection Systems, DAIS 500 for impact damage detection and DAIS 250C for corrosion detection. Several of these systems have been delivered to the USAF, the Canadian Armed Forces, and the Royal Air Force in the UK. The DAIS systems consist of an inspection head containing the optics, CCD camera and light source; a personal computer running DAIS software with inspection planning, acquisition, analysis and repair modules; and remote pendant with touch sensitive screen for controlling the acquisition process (see Figure 1). DAIS requires two operators. The first operator is responsible for placing the inspection head on the surface of the aircraft. The second, the pendant controller, uses preplanned placements shown in the pendant to direct the first operator. Once the required position is achieved, the pendant controller uses the touch screen to save the D Sight image. 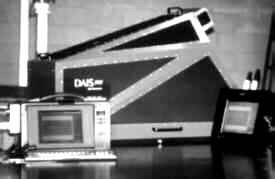 Recently a DAIS 250CV was developed for one man operation. However, this system has limited storage capability. Fig 1: The DAIS 500, with the inspection head in the background and pendant on the right (image courtesy of Diffracto Ltd.). Fig 2: A D Sight inspection of a Boeing 727 lap splice joint. The acquired images are shown on the pendant touch screen. It is possible for the pendant controller to make an immediate assessment, but the recommended procedure is to postpone the image analysis and complete the acquisition process for the whole inspected surface or complete aircraft. This reduces the time during which the aircraft has to be available to the inspectors. Also, image analysis is better carried out at a workstation using a CRT monitor (the DAIS PC and pendant are equipped with LCD screens). Results of the analysis are reported on wire-frame diagrams of the aircraft type and can easily be referenced back to locate the detected damage. An example of a D Sight image from an inspection of a Boeing 727 lap splice joint is shown in Figure 2. Fig 3: A prototype EOL system. 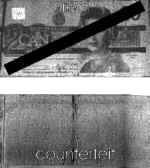 Fig 5: An EOL inspection, using SolidHi, of a real and counterfeit Canadian twenty dollar bill. The simplest implementation of an Edge of Light (EOLTM scanner consists of a light source and a detector held at a constant separation distance. 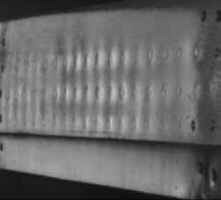 Light passing through a slit is reflected from the inspected surface at a shallow angle and captured by the detector. The technique is relatively quick, with scanning speeds in the order of 2 to 20 linear cm per second and line widths of 10 cm or more. EOL inspection results are easily interpreted, as they closely resemble the actual subject. 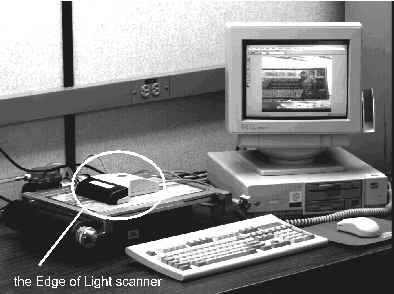 A prototype scanner is shown in Figure 3. The optical path in the EOL scanner converts surface slope changes into light intensity variation. A light source behind a slit is used to produce a rectangular band of light on the surface of the object to be scanned. In the main zone of the band, the intensity is constant. At the edge the intensity does not fall to zero immediately, due to diffraction effects, although it does drop off rapidly with distance. The detector of the EOL scanner is set up to operate in the middle of this "edge of light" zone of rapidly changing intensity. The detector is held at a constant position with respect to the light source, and records the light intensity reflected from the surface. The intensity of light is constant if the surface is smooth. A change in slope appearing in the edge zone changes the angle at which the light is reflected from the surface, which changes the location of the detector in the "edge of light" band and therefore the intensity of light appearing at the detector. The EOL scanner performance can be optimised for a particular application by expanding or compressing the edge zone, varying the angle of illumination, or changing the viewing angle. The scanner travels along the surface of interest providing a high resolution map of the surface topography. An EOL inspection of the centre section of the same Boeing 727 lap splice as the previous Figure 2 is shown below in Figure 4. Fig 4: An EOL inspection of a Boeing 727 lap splice joint. EOL has unique applications in the inspection of small scale surface phenomena, and has been used for the detection of surface breaking fatigue cracks in turbine engine components as well as for forensics applications. 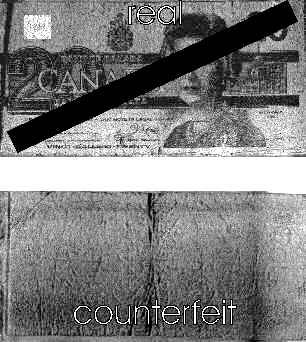 Figure 5 shows an EOL inspection of a real and counterfeit Canadian twenty dollar bill, using IAR's SolidHi highlighter. The printing techniques used for currency generate topography which is not reproduced by duplication methods such as colour photocopying. The key factor for the success of visual and enhanced visual inspection techniques is lighting. Both EOL and D Sight techniques require light to be reflected from the inspected surface to a camera, in the case of D Sight the light is reflected twice off the surface before reaching the camera. Most military aircraft are coated with matte, non-reflective paint. Currently, to allow enhanced visual inspection these surfaces are temporarily wetted with a highlighting fluid. The operators must ensure that the highlighting is sufficient and uniform. Factors such surface finish, paint colour or condition, and cleanliness can also affect inspection performance. The use of the IAR patented solid film highlighter (SolidHiTM) technique provides a constant reflectivity over the inspected surface, preserving topographical information while eliminating extraneous effects. 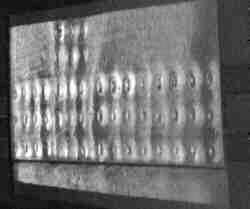 The implementation of SolidHi requires the application of positive or negative pressure to conform a particular film to the surface undergoing inspection. IAR has developed a prototype applicator which is compatible with Diffracto Ltd.'s commercially available DAIS 250C D Sight system. This system is shown in Figure 6. Other prototypes have been used for EOL inspection systems, the EOL image of Figure 5 was made using SolidHi. Fig 6: A bottom view of a prototype SolidHi attachment for a DAIS 250C inspection unit. As previously stated, the inspector's decision process is a crucial element in the reliability of NDT, especially in visual NDT where the process is less controlled. The use of enhanced visual NDT methods is likely to improve reliability over simple visual techniques in two ways: First, the data collection process is better defined. Second, the collection of data can be separated from the process of data analysis. The inspector can collect data, the inspection system can verify that it has stored the data, and the inspector can retreat from the field/hangar environment to analyse the data on a personal computer. In certain cases, it may be possible to develop software such that the analysis can be carried out by the computer and the inspector only be required to verify unusual conditions. In the development of new inspection techniques and new applications, researchers at IAR have found it necessary to develop custom software. Instead of developing separate, ad hoc solutions on a reactive basis, a software system for analysis of NDT data has been developed as a platform for continued research. The NDI Analysis software has been used in many internal projects, including in the development of D Sight inspection techniques and in EOL development. This software platform is also being used to support the development of data fusion for NDT. The use of SolidHi with enhanced visual inspections provides a constant condition, analogous to performing a calibration for an ultrasonic or eddy current system. This means that enhanced visual inspections can be compared to inspections taken at different times without being affected by extraneous variables such as surface condition. Automated analysis is also a possibility given the "calibrated" baseline. Currently, IAR is studying the automated analysis of D Sight and EOL inspections of aircraft fuselage splice joints for corrosion. The fuselage splice joints of transport aircraft are subject to corrosion and fatigue in normal operation. As military and commercial fleets are flown beyond their original design goals, these may become safety and economic limitations on operation. Since the Aloha Airlines incident in 1988, when corrosion and fatigue cracking caused the failure of multiple bays of a lap splice joint on a Boeing 737 during flight, a great deal of money has been invested in developing advanced NDT for fatigue crack and corrosion detection, but none of these new methods are being used in commercial operations. The reliability of most of these new methods has not been demonstrated in field conditions, and thus there is little confidence in the economic and safety benefits of their implementation. The current methods for inspection of the fuselage splice joints are a visual inspection followed by manual, single frequency eddy current. While the reliability of these traditional inspections also has not been demonstrated, they are accepted practice. The greatest costs of any inspections are the lost operating time of the aircraft, followed by the labour required to perform inspections and maintenance. To increase inspection reliability and minimise additional downtime, the visual component of this inspection could be replaced by enhanced visual techniques, and advanced eddy current systems called in where the enhanced visual inspections indicate. IAR has been investigating the use of software algorithms to evaluate corrosion in splice joints as indicated by D Sight and EOL inspections[8,9]. 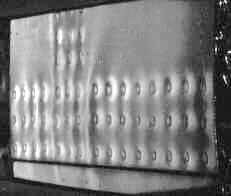 It quickly became apparent that surface reflectivity variations were the largest obstacle to accurate corrosion assessment. SolidHi was then applied to the D Sight inspections, and showed a large improvement in the consistency of results. D Sight inspections were performed with and without solid film highlighter on a specimen cut from a retired Boeing 727-100 aircraft (61,891 flying hours and 54,156 cycles). Specimen OFA-13E is from a longitudinal lap splice joint at Stringer 4, build station (BS) 420-560, of two nominally 0.040" (1 mm) thick skins. D Sight inspections of this specimen, using a DAIS 250C instrument, are shown in Figure 7 without and in Figure 8 with SolidHi. Fig 7: A D Sight inspection of a Boeing 727 lap splice joint, without solid film highlighter. Fig 8: A D Sight inspection of the same lap splice joint shown in Figure 6, with solid film highlighter. 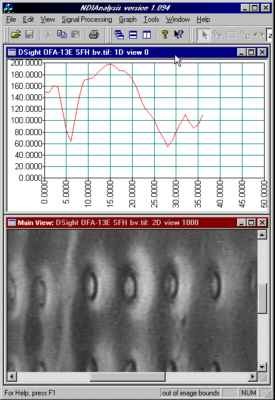 Fig 9: A view of the NDI Analysis software, showing the D Sight image of Figure 8 and the brightness changes along a line between two rivets. Changes in brightness are caused by surface slope changes, in this case these slope changes are due to "pillowing" deformation caused by corrosion in the joint. By analysing the change in brightness in the D Sight image between rivets, an estimate of the magnitude of the corrosion pillowing in that local area can be made. Finite element models of the Boeing 727 lap joint have been developed at IAR. These are used to calculate the amount of material lost to corrosion which produced the pillowing. Figure 9 shows the NDI Analysis software with the D Sight image of Figure 8 and the brightness changes along a line between two rivets in that image. Enhanced visual NDT methods in combination with SolidHi and data storage, enhancement, and analysis capabilities such as those provided by IAR's NDI Analysis software can provide increased reliability over simple visual NDT while retaining the advantages of speed and ease of interpretation over other NDT methods. The technologies described in this work are the outcomes of various projects performed at IAR with numerous collaborators. These include CRAD - Department of National Defence, Diffracto Ltd., Transport Canada, FAA, USAF. D Sight is a trademark of Diffracto Limited of Windsor, Canada. EOL and SolidHi are trademarks of the Institute for Aerospace Research, National Research Council Canada. F. W. Spencer, Visual inspection research project report on benchmark inspections, DOT/FAA/AR-96-65, 1996. M. Lock, Human and Workplace Factors Affecting Reliability in Aircraft Inspection, Insight 37:2, Feb. 1995 pp. 83-94. D. S. Forsyth, A. Fahr, The Sensitivity and Reliability of NDI Techniques for Gas Turbine Component Inspection and Life Prediction, NRC/IAR report LTR-ST-2055, July 1996. J. P. Komorowski, D. L. Simpson, and R. W. Gould, A Technique for Rapid Impact Damage Detection with Implication for Composite Aircraft Structures, Composites, 1990, pp 169-173. R. W. Gould and J. P. Komorowski, Detection of Impact Damage and Delaminations with Large Area Composite Inspection System, DAIS-500, NRC IAR LTR-ST-2031, October 1995. D. S. Forsyth, J. P. Komorowski, A. Marincak, and R. W. Gould, The Edge Of Light Enhanced Optical NDI Technique, Canadian Aeronautics and Space Journal, Vol. 43, No. 4, December 1997, pp. 231-235. R. W. Gould and J. P. Komorowski, Method for Preparing Solid Surfaces for Inspection, US Patent 5,569,342, Oct. 29, 1996. D. S. Forsyth, R. W. Gould, and J. P. Komorowski, Correlation of Enhanced Visual Inspection Image Features with Corrosion Loss Measurements, in Advances in Signal Processing for Non Destructive Evaluation of Materials, Quebec City, August 5-8 1997 (to be published). D. S. Forsyth, J. P. Komorowski, and R. W. Gould, The Use of Solid Film Highlighter in Automation of D Sight Image Interpretation, in "Nondestructive Evaluation of Aging Aircraft, Airports, and Aerospace Hardware II", SPIE 3397, April 1998, pp 50-56. N. C. Bellinger, S. Krishnikumar, and J. P. Komorowski, Modelling of Pillowing Due to Corrosion in Fuselage Lap Joints, Canadian Aeronautics and Space Journal, Vol. 40, No.3, March 1994, pp. 125-130.